San Diego County Credit Union — which boasts a Guinness World Record for the most paper shredded in 8 hours — is planning another of its Super Shred Events this weekend. Free shredding services will be 9 a.m. to noon Saturday, March 9, at 25165 Madison Avenue in Murrieta; San Ysidro Branch at 2036 Dairy Mart Road, Suite 130; and the SDCCU Operations Center at 6545 Sequence Drive in Mira Mesa. A gift is promised the first 200 people at each location. The public is invited to bring a maximum of two boxes containing personal and confidential information to have it shredded on the spot at no charge in the parking lot of these three SDCCU locations. 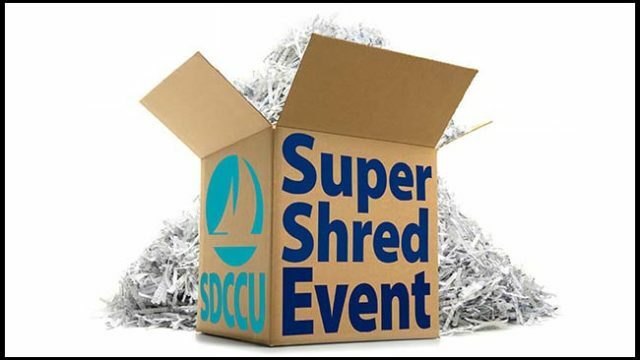 SDCCU began hosting its Free Shred Day events in 2007 and has since collected, shredded and recycled over 4 million pounds of paper, saving nearly 35,000 trees (every 120 pounds shredded represents one saved tree). Last year’s event, held at SDCCU Stadium, resulted in the collection of a total of over 500,000 pounds of paper, saving more than 4,250 trees. “SDCCU proudly remains the current Guinness World Records title holder for the most paper collected in 24 hours and the most paper shredded in 8 hours,” the bank said.